It’s so much easier to for me to think sweet treats for Halloween – but why not try these lovely chicken bacon and leek Halloween pies, you can also use this recipe to make a large family pie. Once you get to grips with the glaze idea you’ll be using it on all sorts of things! Make the filling first, I prefer it to go into pies cool rather than hot – it stops the pie lid pastry from sweating and drooping! The pictures show me making the family sized filling so if you’re making the mini pies remember that your quantities are a lot less! Add a little oil to a large pan and fry the chicken until lightly browned. If your making miniature pies you will need the chicken fairly finely diced. Add the bacon lardons to the pan with the chicken and fry until they are cooked. Season well with salt and pepper. Prepare the leeks and slice finely. Add to the pan and cook for a couple of minutes until just starting to soften. Remove the pan from the heat and transfer the mixture to a large bowl. Place the pan back on the hob and add the butter. Fry until melted. Add the flour to the melted butter and stir well to combine. Cook this paste for a couple of minutes stirring continuously. Now begin to add the milk a little at a time, stirring the mixture well, I like to use a whisk. As soon as it combines nicely add a little more milk and so on until all the milk is in the pan. Adding the milk slowly should mean you have a non-lumpy sauce! 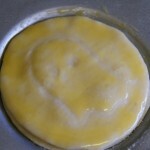 Allow the sauce to cook stirring constantly until its consistency is similar to a runny custard. It will continue to thicken up as the pie cooks in the oven. Add your ‘runny custard’ white sauce to the bowl of chicken, bacon and leek and stir well. Cover and allow the pie filling to cool. Time to make pastry – rub the butter into the flour using your fingertips or a food processor. Begin to add the water a little at a time until the pastry comes together. 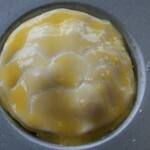 Wrap the ball of pastry in the fridge and chill for half an hour. Grease the recesses of a bun tray. Lightly flour your worksurface and roll out half of the pastry, a medium thickness, not too thick but we’re not aiming for super thin either. Cut out circles and use to line the recesses of the tin. Roll out the remaining pastry and cut out lids for your mini pies. Fill each pastry case with pie filling. 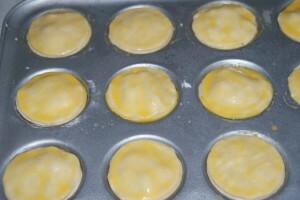 Dampen the top edge of the pastry and sit the lids into position, sealing them together with your fingers. Now place the tray of pies into the fridge to chill for half and hour. This will help with the next fun bit! 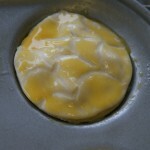 Beat together the egg and the extra egg yolk. Take the pies from the fridge and brush the tops liberally with the glaze. Take a paintbrush and using the end – engrave Halloween patterns into the glaze. Practice on some scrap pastry if you’d like. The idea is to take away the glaze and create the picture. Keep wiping the end of the paintbrush clear of glaze using a paper towel. You will see my designs are basic – spider, pumpkin, ghost and spiders web (and a little bit childlike?) but are so effective! You can also do this to a family pie if the mood takes you but watch out they don’t expect a new design everytime you serve pie! Preheat the oven to 180c (fan)/200c/Gas Mark 5 and bake in the oven for 20 minutes until golden. If you’re making a family pie bake in the oven for 35-40 minutes. 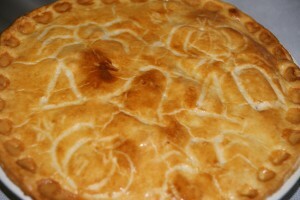 This entry was posted in Halloween, Peanut, Pie, Savoury, Treats. Bookmark the permalink. what a lovely idea… and I think the bit with the end of the paintbrush is genius… thanks for the tip! Oh these are so cute! 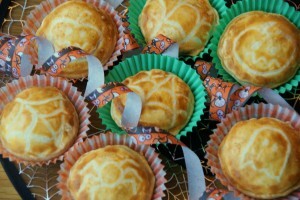 It’s really nice to see a savoury Halloween treat and I love the trick of de-glazing the tops to make a pattern. Wonderful! These sound so good. The paintbrush un-glazing is inspired and its so good to have a savoury halloween treat under bucketloads of trick or treat sweets. Saw you on last years Bake off show, great recipes!! 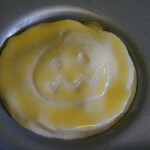 The Halloween pies looks good will have to give them a try. 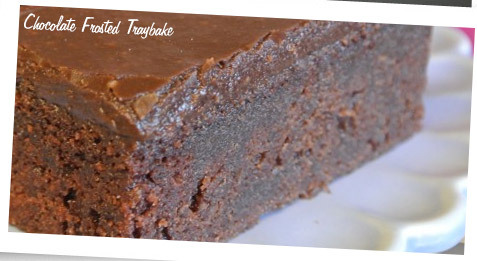 Great recipe Ruth – thankyou. I may be making these for a bunch of Bikers this Halloween – don’t ask! I’m sure they will love them! BTW – Where’s your book! Am top of the list to buy it when it comes out!! What a great idea. I love the Halloween designs. These are too cute! Minature pies, I love it.